Perhaps it's appropiate that the first single from the new Tom Petty album is "The Waiting." That is exactly what his growing legion of fans had been during during the year-plus gap Petty had between records -- waiting. 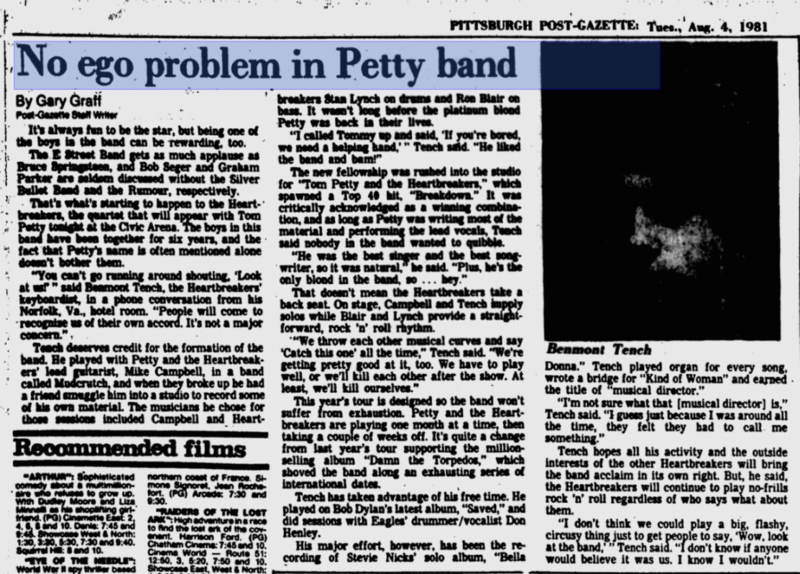 Petty scored heavily with his "Damn the Torpedoes," and followed the success of the album with an equally convincing tour. But the question seemed to linger: "Can he match or better his last effort?" 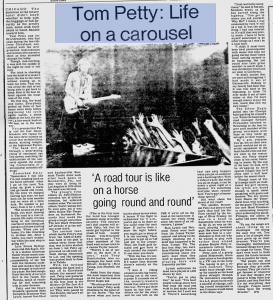 SARATOGA SPRINGS -- When Tom Petty sang the line "Saratoga rain" for "Louisiana Rain" Sunday night at SPAC, he paid a sincere tribute to the 12,300 fans who braved a series of downpours to see him. "I'm impressed," he said, squinting into the rain. So were his fans, by the best rock show this summer. Opening act Split Enz tried to be the band in their song "Hard Act to Follow" but Petty blew away the competition -- and his rain-soaked fans with passionate rock and roll. Petty was almost unknown when he opened for Edgar Winters at the Palace in 1977, yet "star" was written all over him. He had classic Chuck Berry moves onstage and a tight, basic-rock band. He had beautiful pop songs with great hooks and a convincingly innocent romanticism. He was hot, but also tender. He rocked, but his music expressed feelings he wasn't afraid to show. Backstage, he said "I'm trying to play music that sounds alive on the radio." One of the really exciting things that occasionally happens in rock 'n' roll is to see an artist suddenly transformed from one of those guys who puts out records into a star. It is even better when the buy turns out to be good besides. This is what happened about a year ago with Tom Petty. He went from your average rocker in the usual throes of bankruptcy and personal travail straight to the top with an album called "Damn the Torpedos." His eagerly awaited second album as a star could be called "Half Speed Ahead" with no disrespect intended. 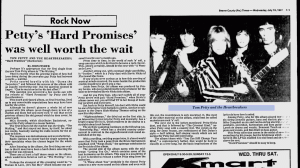 "Hard Promises" (Backstreet) is a moody, blues-rock album that doesn't try to blow anyone out of the water. It just delivers excellent music excellently executed. There is a heavy layer of laid-back. But there are also several rock out tunes such as "Kings Road" and "A Thing About You" that show the skinny, blond kid can still play a mean pinball. Most arena rock concerts aren't exactly concerts. They are carefully staged spectacles in which the music often takes a back seat to special effects and showmanship. Tom Petty and the Heartbreakers, whose two most recent albums have won them a following large enough to fill arenas and stadiums, have announced their opposition to this trend. They are, in Mr. 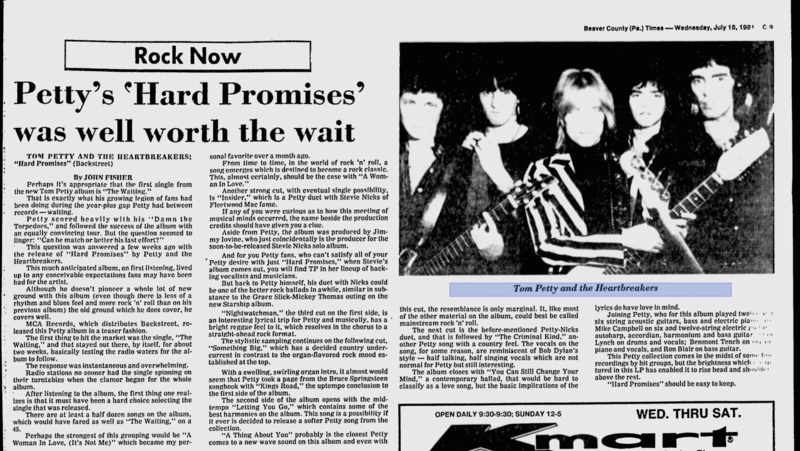 Petty's words, a group for "people who just want to hear a rock-and-roll band." Mr. 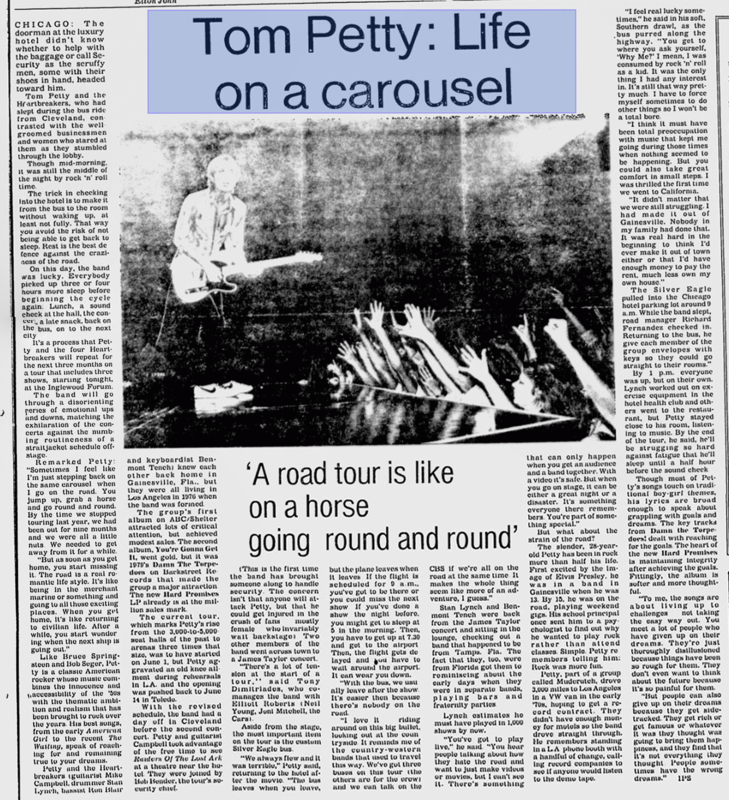 Petty's Thursday evening performance at the Byrne Meadowlands Arena in Rutherford, N.J., was his first in the area since the release of his album "Hard Promises," which has cemented the reputation he established with last year's superb "Damn the Torpedoes." When Mr. Petty visited New York during his "Damn the Torpedoes" tour, he played in smaller halls like the Palladium, and one wondered how his relatively unassuming show, which is conspicuously lacking in smoke bombs, snazzy lighting and the other paraphernalia of big-time rock, would fare in a larger hall. One needn't have worried. The Heartbreakers were even looser and more informal in the Meadowlands arena, which is roughly the size of Madison Square Garden but has much better acoustics, than they had been at the much smaller Palladium. CHICAGO: The doorman at the luxury hotel didn't know whether to help with the baggage or call Security as the scruffy men, some with their shoes in hand, headed toward him. Tom Petty and the Heartbreakers, who had slept during the bus ride from Cleveland, contrasted with the well-groomed businessmen and women who stared at them as they stumbled through the lobby. Though mid-morning, it was still the middle of the night by rock 'n' roll time. The trick in checking into the hotel is to make it from the bus to the room without waking up, at least not fully. That way you avoid the risk of not being able to get back to sleep. Rest is the best defence against the craziness of the road. It's always fun to be the start, but being one of the boys in the band can be rewarding, too. The E Street Band gets as much applause as Bruce Springsteen, and Bob Seger and Graham Parker are seldom discussed without the Silver Bullet Band and the Rumour, respectively. That's what's starting to happen to the Heartbreakers, the quartet that will appear with Tom Petty tonight at the Civic Arena. 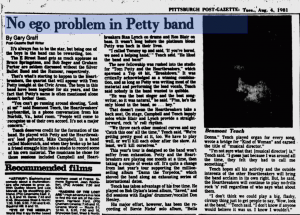 The boys in this band have been together for six years, and the fact that Petty's name is often mentioned alone doesn't bother them. "You can't go running around shouting, 'Look at us!'" said Benmont Tench, the Heartbreakers' keyboardist, in a phone conversation from his Norfolk, Va. hotel room. "People will come to recognize us of their own accord. It's not a major concern." Editor's Note: I find this review personally frustrating as it focuses more on the opening act than it does Petty (he only gets 3 sentences!). I have nothing against the opening act, but it's Petty's show, and that's what the review should be about. I'm not alone in thinking this. Time was when an opening act would inspire my rock curiosity to such an extent that I would run right out the day after a show and buy the group's latest album. With a little luck, the band would end up with lots of my cash in its bank account before too long. Joe Ely's performance as support act to Tom Petty last night in the Civic Arena was such a case. Raised in Lubbock, Texas (also the home of Buddy Holly), Ely's fame has been increasing steadily since his tour with the Clash last year here and in England. A recent blurb in Time about this erstwhile country rocker turned "new country" called him the inheritor of the Outlaws' (Willie and Waylon) raunchiness. Tom Petty understands his audience. At least, he seems to, and that was alright with about 7,000 of his fans at the Civic arena last night. Those fans are teen-agers, and Petty sings of teen passions and frustrations. When they scream their agreement for a line like "sometimes this old town seems so hopeless" from "Here Comes My Girl," you have to believe you know what he's talking about. There is a twist to this year's version of Petty's show, however. Songs like "American Girl" (the opener), "She Don't Need You," "I Got A Thing About You," and "The Waiting" were statements of defiance and triumph. Petty's found his satisfaction and he's not going to lose it without a good fight. Which he appears quite capable of. Last night, he came out like a gunfighter, rushing to greet the fans that crowded the aisles almost immediately, almost daring anything to come challenge his newfound contentment. I can't say I have been overly impressed with Tom Petty's last two albums, in particular Damn the Torpedoes. They have their moments but rarely do the numbers shine or stand out. Petty has always paid tribute to one of the truly great American groups, the Byrds. And this album you can hear it more so than on his other albums. The single, The Waiting is a classic example of what I mean. One problem that most groups have when they copy or imitate a group, is that they can't find their own sound. I believe Petty has, on this album, with the song The Night Watchman, even though it has a Dylanesque sound to it. Recommendation: Take your time with this album. Don't throw it away, given time you will enjoy and treasure it.